Here Comes the Sun: Mirrors in orbit would reflect sunlight onto huge solar panels, and the resulting power would be beamed down to Earth. Imagine looking out over Tokyo Bay from high above and seeing a man-made island in the harbor, 3 kilometers long. A massive net is stretched over the island and studded with 5 billion tiny rectifying antennas, which convert microwave energy into DC electricity. Also on the island is a substation that sends that electricity coursing through a submarine cable to Tokyo, to help keep the factories of the Keihin industrial zone humming and the neon lights of Shibuya shining bright. But you can’t even see the most interesting part. Several giant solar collectors in geosynchronous orbit are beaming microwaves down to the island from 36 000 km above Earth. It’s been the subject of many previous studies and the stuff of sci-fi for decades, but space-based solar power could at last become a reality—and within 25 years, according to a proposal from researchers at the Japan Aerospace Exploration Agency (JAXA). The agency, which leads the world in research on space-based solar power systems, now has a technology road map that suggests a series of ground and orbital demonstrations leading to the development in the 2030s of a 1-gigawatt commercial system—about the same output as a typical nuclear power plant. It’s an ambitious plan, to be sure. But a combination of technical and social factors is giving it currency, especially in Japan. On the technical front, recent advances in wireless power transmission allow moving antennas to coordinate in order to send a precise beam across vast distances. At the same time, heightened public concerns about the climatic effects of greenhouse gases produced by the burning of fossil fuels are prompting a look at alternatives. Renewable energy technologies to harvest the sun and the wind are constantly improving, but large-scale solar and wind farms occupy huge swaths of land, and they provide only intermittent power. Space-based solar collectors in geosynchronous orbit, on the other hand, could generate power nearly 24 hours a day. Japan has a particular interest in finding a practical clean energy source: The accident at the Fukushima Daiichi nuclear power plant prompted an exhaustive and systematic search for alternatives, yet Japan lacks both fossil fuel resources and empty land suitable for renewable power installations. Soon after we humans invented silicon-based photovoltaic cells to convert sunlight directly into electricity, more than 60 years ago, we realized that space would be the best place to perform that conversion. The concept was first proposed formally in 1968 by the American aerospace engineer Peter Glaser. In a seminal paper, he acknowledged the challenges of constructing, launching, and operating these satellites but argued that improved photovoltaics and easier access to space would soon make them achievable. In the 1970s, NASA and the U.S. Department of Energy carried out serious studies on space-based solar power, and over the decades since, various types of solar power satellites (SPSs) have been proposed. No such satellites have been orbited yet because of concerns regarding costs and technical feasibility. The relevant technologies have made great strides in recent years, however. It’s time to take another look at space-based solar power. A commercial SPS capable of producing 1 GW would be a magnificent structure weighing more than 10 000 metric tons and measuring several kilometers across. To complete and operate an electricity system based on such satellites, we would have to demonstrate mastery of six different disciplines: wireless power transmission, space transportation, construction of large structures in orbit, satellite attitude and orbit control, power generation, and power management. Of those six challenges, it’s the wireless power transmission that remains the most daunting. So that’s where JAXA has focused its research. 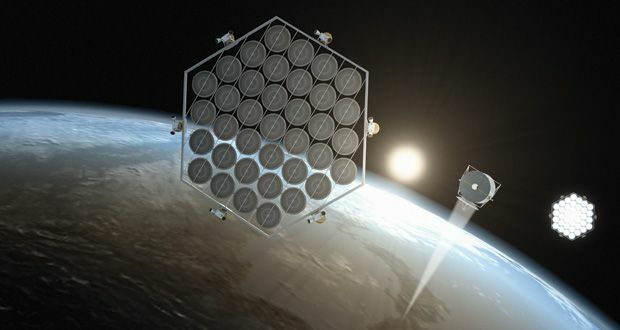 The Japan Aerospace Exploration Agency is working on several models for solar-collecting satellites, which would fly in geosynchronous orbit 36 000 kilometers above their receiving stations. With the basic model [top left-hand side], the photovoltaic-topped panel’s efficiency would decrease as the world turned away from the sun. The advanced model [top right-hand side] would feature two mirrors to reflect sunlight onto two photovoltaic panels. This model would be more difficult to build, but it could generate electricity continuously.In either model, the photovoltaic panels would generate DC current, which would be converted to microwaves aboard the satellite. The satellite’s many microwave-transmitting antenna panels would receive a pilot signal from the ground, allowing each transmitting panel to separately aim its piece of the microwave beam at the receiving station far below.Once the microwave beam hits the receiving station, rectifying antennas would change the microwaves back to DC current. An on-site converter would change that current to AC power, which could be fed into the grid. Wireless power transmission has been the subject of investigation since Nikola Tesla’s experiments at the end of the 19th century. Tesla famously began building a 57-meter tower on New York’s Long Island in 1901, hoping to use it to beam power to such targets as moving airships, but his funding was canceled before he could realize his dream. To send power over distances measured in millimeters or centimeters—for example, to charge an electric toothbrush from its base or an electric vehicle from a roadway—electromagnetic induction works fine. But transmitting power over longer distances can be accomplished efficiently only by converting electricity into either a laser or a microwave beam. The laser method’s main advantages and disadvantages both relate to its short wavelength, which would be around 1 micrometer for this application. Such wavelengths can be transmitted and received by relatively small components: The transmitting optics in space would measure about 1 meter for a 1-GW installation, and the receiving station on the ground would be several hundred meters long. However, the short-wavelength laser would often be blocked by the atmosphere; water molecules in clouds would absorb or scatter the laser beam, as they do sunlight. No one wants a space-based solar power system that works only when the sky is clear. But microwaves—for example, ones with wavelengths between 5 and 10 centimeters—would have no such problems in transmission. Microwaves also have an efficiency advantage for a space-based solar power system, where power must be converted twice: first from DC power to microwaves aboard the satellite, then from microwaves to DC power on the ground. In lab conditions, researchers have achieved about 80 percent efficiency in that power conversion on both ends. Electronics companies are now striving to achieve such rates in commercially available components, such as in power amplifiers based on gallium nitride semiconductors, which could be used in the microwave transmitters. In their pursuit of an optimal design for the satellite, JAXA researchers are working on two different concepts. In the more basic one, a huge square panel (measuring 2 km per side) would be covered with photovoltaic elements on its top surface and transmission antennas on its bottom. This panel would be suspended by 10-km-long tether wires from a small bus, which would house the satellite’s controls and communication systems. Using a technique called gravity gradient stabilization, the bus would act as a counterweight to the huge panel. The panel, which would be closer to Earth, would experience more gravitational pull down toward the planet and less centrifugal force away from it, while the bus would be tugged upward by the opposite effects. This balance of forces would keep the satellite in a stable orbit, so it wouldn’t need any active attitude-control system, saving millions of dollars in fuel costs. 2037:Commercial space-based solar power industry (one launch per year). The problem with this basic SPS configuration is its inconstant rate of power generation. Because the photovoltaic panel’s orientation is fixed, the amount of sunlight that hits it varies greatly as the geosynchronous satellite and Earth spin. 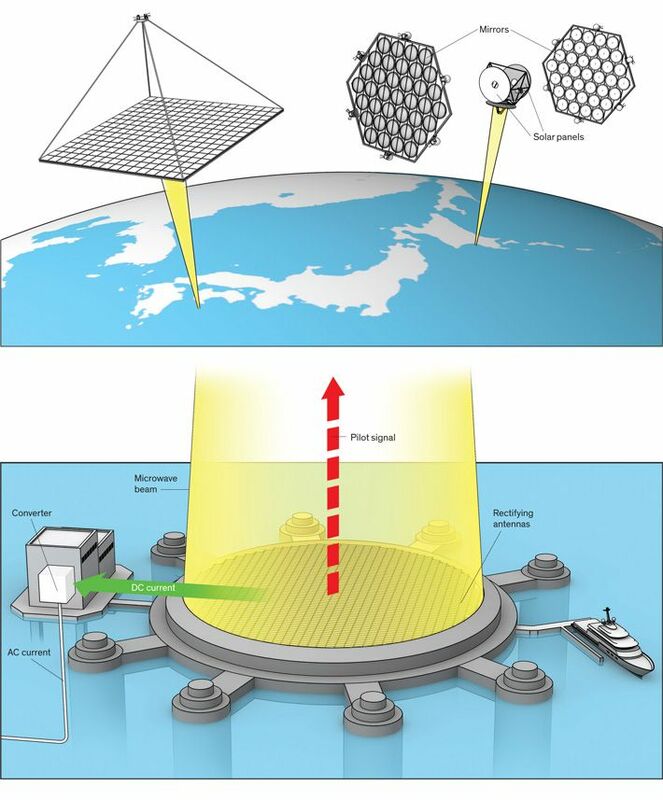 So JAXA has come up with a more advanced SPS concept that solves the solar collection problem by employing two huge reflective mirrors. These would be positioned so that between the two of them, they would direct light onto two photovoltaic panels 24 hours a day. The two mirrors would be free flying, not tethered to the solar panels or the separate transmission unit, which means that we would have to master a sophisticated kind of formation flying to implement this system. Space agencies have some experience with formation flying, most notably in the docking maneuvers performed at the International Space Station, but coordinating a formation flight involving kilometer-scale structures is a big step from today’s docking procedures. We would also have to make several other breakthroughs before this advanced type of SPS could be built. We’d need very light materials for the mirror structures to allow for the formation flight, as well as extremely high-voltage power transmission cables that could channel the power from the solar panels to the transmission unit with minimal resistive losses. Such technologies would take years to develop, so if one or more nations do embark on a long-term project to exploit space-based solar power, they may employ a two-phase program that begins with the basic model while researchers work on the technologies that will allow for next-generation systems. To generate the microwaves, researchers have proposed vacuum tubes such as magnetrons, klystrons, or traveling wave tubes, because their power conversion efficiency is reasonably high—typically 70 percent or higher—and they’re relatively inexpensive. Semiconductor amplifiers are getting better all the time, however; their efficiencies are going up, and their costs are coming down. Cost is important here because a 1-GW commercial SPS would have to include at least 100 million 10-watt semiconductor amplifiers. To choose a microwave frequency for transmission, we have to weigh several factors. Low-frequency microwaves penetrate the atmosphere well, but they require very large antennas, which would make construction and maintenance more complicated. Frequencies in the range of 1 to 10 gigahertz offer the best compromise between antenna size and atmospheric attenuation. Within this range, 2.45 and 5.8 GHz are the potential candidates because they are in the bands set aside for industrial, scientific, and medical uses. Of these, 5.8 GHz seems particularly desirable because the transmitting antennas can be smaller. Making a powerful beam of microwaves is important, of course, but the next step is a lot trickier: aiming the beam precisely so that it travels the 36 000 km to hit the rectifying antennas spot on. Consider that the microwave transmission system would be composed of a number of antenna panels, each measuring perhaps 5 meters long, that would be covered in tiny antennas: In total, more than 1 billion antennas would likely be installed on a single SPS. Coordinating the microwaves generated by this vast swarm of antennas won’t be easy. To produce a single, precisely focused beam, the phases of the microwaves sent from all the antenna panels must be synchronized. That would be hard to manage, as these panels would move relative to each other. This challenge of precisely directing a beam from a moving source is unique and hasn’t been solved by existing communication technologies. The beam must have very little divergence to prevent it from spreading out over too large an area. To send power at the 5.8-GHz frequency to a rectifying antenna, or rectenna, with a diameter of 3 km, the divergence must be limited to 100 microradians and the beam must have a pointing accuracy of 10 µrad. JAXA’s solution involves a pilot signal that would be sent from the rectenna on the ground. As each individual antenna panel on the satellite received the pilot signal, it would calculate the necessary phases for its microwaves and adjust accordingly. The sum of all these adjustments is a tight beam that would zing down through the atmosphere to hit the rectenna. Such phase-adjusting technologies, known as retrodirective systems, have been used in small-scale antenna arrays in space, but additional work would be needed before they could coordinate several kilometers of orbital transmitters. Once the beam reaches the receiving site, the rest of the process would be relatively easy. Arrays of rectennas would convert the microwave power to DC power with an efficiency greater than 80 percent. Then the DC power would be converted to AC and fed into the electrical grid. When laypeople hear these orbital solar farms described, they often ask if it would be safe to send a powerful beam of microwaves down to Earth. Wouldn’t it cook whatever’s in its path, like food in a microwave oven? Some people have a grisly mental image of roasted seagulls dropping from the sky. In fact, the beam wouldn’t even be intense enough to heat your coffee. In the center of the beam in a commercial SPS system, the power density would be 1 kilowatt per square meter, which is about equal to the intensity of sunlight. As the regulatory limit for sustained human exposure to microwaves is typically set at 10 watts per square meter, however, the rectenna site would have to be a restricted area, and maintenance workers who enter that zone would have to take simple precautions, such as donning protective clothing. But the land outside the rectenna site would be perfectly safe. At a distance of 2 km from its center, the beam’s power density will have already dropped below the regulatory threshold. In 2008, on a mountaintop on Hawaii’s main island, a rectenna received a beam of microwaves sent from the slopes of a volcano on the island of Maui, about 150 km away. That demonstration project, led by former NASA physicist John Mankins and recorded for a show on the Discovery Channel, was modest in its ambitions: Only 20 W of power were generated by the solar panels on Maui and beamed across the ocean. This setup was far from ideal because the microwaves’ phases were disturbed during this horizontal transmission through the dense atmosphere. Most of the power was lost in transmission, and less than a microwatt was received on the Big Island. But the experiment did demonstrate the general principle to an admiring public. And it’s worth remembering that in a space-based system, the microwaves would pass through dense atmosphere only for the last few kilometers of their journey. In Japan, we are now planning a series of demonstrations for the next few years. By the end of this year, researchers expect to perform a ground experiment in which a beam of hundreds of watts will be transmitted over about 50 meters. This project, funded by JAXA and Japan Space Systems, will be the world’s first demonstration of high-power and long-range microwave transmission with the critical addition of retrodirective beam control. The microwave transmitter consists of four individual panels that can move in relation to one another in order to simulate antenna motion in orbit. Each panel, measuring 0.6 meter by 0.6 meter, contains hundreds of tiny transmitting antennas and receiving antennas to detect the pilot signal, as well as phase controllers and power management systems. Each panel will transmit 400 W, so that the total beam will carry 1.6 kW; in this early-stage experiment, we expect the rectenna to have a power output of 350 W.
In space there is 10 times as much available solar energy as on Earth: There are no efficiency reductions due to the day-night cycle, seasonal variation, or weather conditions. Next, JAXA researchers hope to conduct the first microwave power transmission experiment in space, sending several kilowatts from low Earth orbit to the ground. This step, proposed for 2018, should test out the hardware: We hope to demonstrate microwave beam control, evaluate the system’s overall efficiency, and verify that the microwave beam doesn’t interfere with existing communications infrastructure. We also have some space science to conduct. We want to be sure that the intense microwave beam isn’t distorted or absorbed by the plasma of the ionosphere, the upper-atmosphere layer that contains electrically charged particles. We’re pretty sure that the beam won’t interact with this plasma, but our hypothesis can be confirmed only in the space environment. If all goes well with these initial ground and space demonstrations, things will really start to get interesting. JAXA’s technology road map calls for work to begin on a 100-kW SPS demonstration around 2020. Engineers would verify all the basic technologies required for a commercial space-based solar power system during this stage. Constructing and orbiting a 2-megawatt and then a 200-MW plant, the next likely steps, would require an international consortium, like the ones that fund the world’s giant particle physics experiments. Under such a scenario, a global organization could begin the construction of a 1-GW commercial SPS in the 2030s. It would be difficult and expensive, but the payoff would be immense, and not just in economic terms. Throughout human history, the introduction of each new energy source—beginning with firewood, and moving on through coal, oil, gas, and nuclear power—has caused a revolution in our way of living. If humanity truly embraces space-based solar power, a ring of satellites in orbit could provide nearly unlimited energy, ending the biggest conflicts over Earth’s energy resources. As we place more of the machinery of daily life in space, we’ll begin to create a prosperous and peaceful civilization beyond Earth’s surface. Sasaki, a professor emeritus at the Japan Aerospace Exploration Agency, spent much of his 41-year JAXA career researching space-based solar power systems. The best-case scenario for this technology, he says, is a global “paradigm shift” in which nations stop competing for energy resources on the ground, and instead work together to build grand orbital power stations that beam clean energy down to Earth. He remains optimistic. This entry was posted in Free energy, Solar on 17 May, 2016 by Peacefull.